There are two sides to rebounding; defensive rebounding and offensive rebounding. Defensive rebounding is going to allow teams to be able to close out defensive possessions and to get the transition offense off and running. Without being able to defensive rebound at a high-level, opponents will continue to get chances to score, and this will put a considerable strain on the defense. So it is essential that teams and players are able to finish plays with defensive boards. On offense, a good rebounder is trying to create second-chance points for their team. They are looking to get a tip out, or to grab a missed shot for a score of their own. Both of these will help to undermine the other team’s defensive efforts and create quality scoring opportunities. These basketball rebounding drills are going to work on both defensive and offensive rebounding. They will work on all of the details of boxing out, going to get the ball, securing it, etc. Some of these rebounding drills are also going to work on what to do after pulling down the board. They will teach the player how to score off of an offensive rebound, or how to outlet the ball on a defensive rebound to get the offense going. So as much as rebounding the basketball is a mindset, it is also a skill that can be learned and developed. 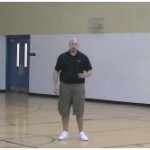 All of these basketball training videos are going to cover different rebounding drills and will allow for developing the skill of rebounding. If you want a team that is going to battle on the boards for every rebound, you must be willing to invest the time. 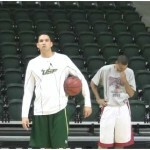 Not only the time in teaching them how to rebound but also in emphasizing its importance every day. It will be up to you as a coach to emphasize this within your program, but with these training videos, you will have all of the tools that you need to work on it. These basketball rebounding drills will teach your players everything that they need to know about battling on the boards. 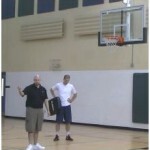 This will not only help in creating better rebounders, but they will also help to inspire. Like anything, people enjoy doing things that they are good at. So if you are able to teach your players how to be high-level rebounders, they are going to have a higher tendency to want to rebound. If you are looking for competition based rebounding drills, make sure that check out our basketball competition drills and basketball team drills. 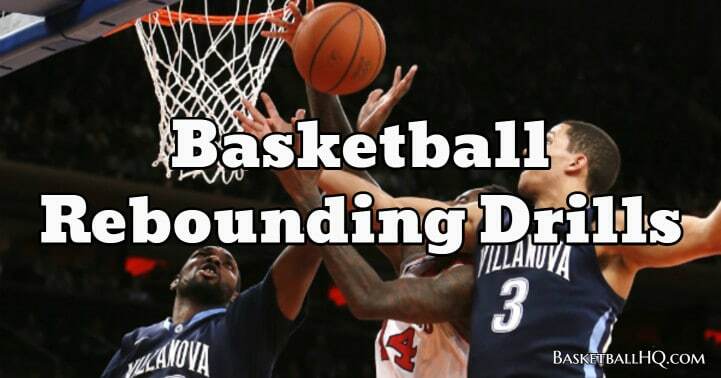 These will offer some great live action rebounding drills for you to use with your team. In your pursuit of being the best player that you can be, rebounding the basketball should be pretty high up on your list. Not only will rebounding help you become a better player, but it is also an area that directly helps your team. 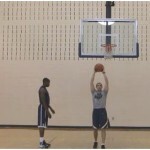 So if you are looking for a way to earn more playing time with your team, rebounding is a great opportunity to do that. You don’t have to be a post player to be a great rebounder either. There are plenty of guards that are able to get on the boards to finish plays on defense, and also create more scoring chances for their team on offense. So regardless of the position that you play, you can be a great rebounder. 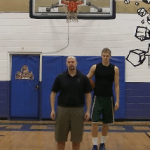 Use these basketball rebounding drills to help you develop your overall game. These drills will teach you how to fight for position, react quicker to the ball, and then go attack the board. They will also teach you what to do after you get the ball as well. And, a lot of these basketball drills are going to work on vertical as well. So along with rebounding, you will be able to work on your vertical jump and being more explosive as well. 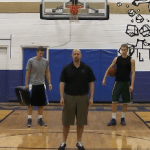 A good portion of these rebounding drills can be done without a partner as well. 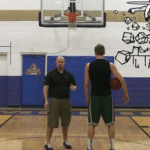 So you don’t need a coach or partner to work on your rebounding. Use the single player rebounding drills to work on becoming an elite rebounder. When doing these basketball rebounding drills, there are going to be areas that you should be focusing on to make sure that you are getting the most out of the drill. Not only will these teaching points help to maximize the drills, but they will also help these skills better translate over to a game. So as you do all the different rebounding drills below, lock in on these different teaching points. Rebounding is a very technical skill. The better a player can master the different techniques, the better they will be at rebounding. There are three main parts of rebounding. The first is going to be positioning. The player needs to fight for positioning before the shot goes up. If they wait until the ball is shot, it is too late. Secondly, they need to anticipate where the miss is going to go and then be the first to move to go get it. And lastly, they need to go secure the ball with two hands and then keep it in a position of strength. It isn’t enough to get a hand on the ball and then lose it to the other team; you need to grab it and secure it as well. After the rebound, it is important that players get right into what needs to happen next. With an offensive board, the quicker a player can attack or kick the ball to a teammate, the easier it will be to score; you don’t want to let the defense recover. With a defensive board, if a player can quickly outlet the ball or take off themselves with the dribble, they put pressure on the other team to get back. Defensive rebounds should be used as opportunities to start your team’s early offense. As much as rebounding can be improved on with the right technique, it still has to be a mindset. Players must have the mindset to compete and fight for every rebound. They won’t get every board, but if they fight, they will have a chance to. Also, if a player is really fighting on the boards, they may not get the actual rebound, but a teammate may. The only way this happens though is if they are willing to fight on every shot. This backboard tips rebounding drill is going to help the player to develop soft hands around the basket and a quick second jump. This is a great rebounding basketball drill that works on going from guarding the post to turning and boxing out once the shot goes up. This is a great offensive rebounding drill to work both on timing and touch around the basket when it comes to tipping the ball back in on a miss. The 5 spot offensive rebounding drill is great for teaching players to locate and then aggressively pursue an offensive board. This alternating tips drill is going to help the player work developing soft hands around the basket, timing, and developing a quick second jump. This is a great rim touch rebounding drill to work on the fundamentals of boxing out, but then also work on the players ability to release to get the ball. The ball high finish rebounding drill is going to teach the player to offensive rebound, and then keep the ball high on the finish. The shot fake finish rebounding drill is going to first teach the player to offensive rebound, but then also how to finish around the basket. This shot fake finish drill is going to work on getting an offensive rebound, and then knowing what to do with the ball afterwards. This Kevin Love rebounding drill will help you become a better rebounder around the basket, teach you how to battle for every rebound. With this basketball rebounding finish drill you are going to work on rebounding the basketball and then using a quick finish before the defender can react and get up off the ground to block your shot. The post defense lane slides basketball rebounding finish drill was designed to work on going from guarding the post to turning and boxing out once the shot goes up. 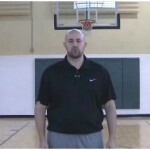 The reaction rebounding drill allows the player to work on his reaction quickness and his ability to go and get the basketball after the miss. 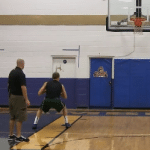 For this basketball rebounding and finish drill you are going to practice tipping the basketball out to yourself and then attacking before the defense can get reset. The reverse reaction rebounding drill is going to teach the player to quickly locate the ball on a missed shot, and then how to react to the board. 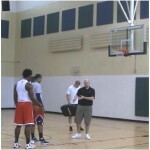 The Superman rebounding drill is going to teach the player to aggressively pursue rebounds that are out of their area. The superman reverse finish rebounding drill is going to help the player learn to rebound out of area, and then finish the offensive rebound. 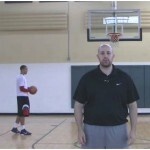 This tip dunk rebounding drill is going to help the player work on their timing and locating the basketball as it comes off of the rim. It takes practice when learning how to get offensive rebounds and then score the ball. 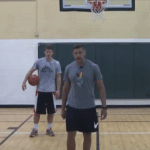 Learn some tips with this basketball offensive rebounding drill. The Kevin Mchale tips advanced basketball rebounding drill is going to help the player work on their timing, finishing around the basket, and quick jump ability. This is a great basketball rebounding drill because it allows you to work on rebounding and then finishing around the basket all at the same time. This basketball rebounding and finishing drill will help you to work on your rebounding and then also using the shot fake and reverse finish to score at the basket. This offensive basketball rebounding drill is going to help you learn to tip the ball out to yourself and then immediately attach before the defender gets set. The reverse reaction basketball rebounding drill is great for improving your reaction quickness to when the shot goes up. This basketball rebounding drill is great for practicing your reaction time and then also working on finishing quickly around the basket. This superman basketball rebounding drill works on being able to rebound out of area but also on finishing quickly with a pivot finish. This rebounding drill is going to teach the player how to rebound out of area and then finish around the basket after they get the board.